« Flashdancers and all that jazz. 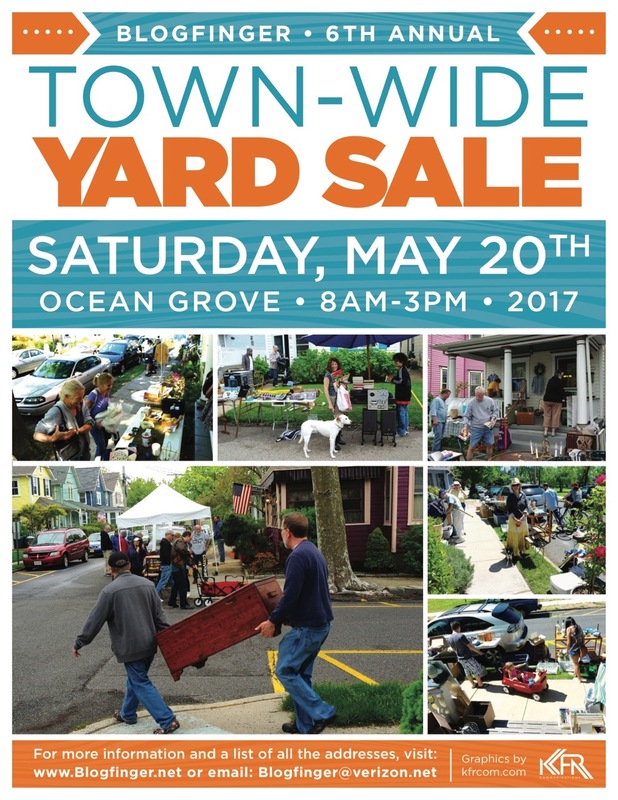 OG TOWN-WIDE YARD SALE LIST. SATURDAY, MAY 20, 8 AM TO 3 PM. 49 sites. TRAFFIC ISSUE: Rt 33 in Neptune will be closed on May 20 in both directions from Neptune Boulevard to NJ Rt. 35. There will be a detour. If you can get to Asbury Park, just continue south on Main Street (Rt 71) and turn left into Ocean Grove. Anyone who is on Rt. 35 can turn east at Rt 33 and enter Ocean Grove that way. 73 Mt. Hermon Way (near New York Ave.) Household items, mirror, jewelry, lamp, TV stand and numerous other items. 84 Mt. Hermon Way: Household items, collectibles, DVD’s, jewelry, lamps, garden trellises, women’s clothing (casual). Many unique items! 61 Delaware Ave.: Furniture, mirrors, home décor, kitchen items, artwork, jewelry, —downsizing and need to get rid of stuff. Also Domain entertainment center; chinoiserie dresser, LaZ Body recliner, wall art, mirrors, kitchen items, wrought iron twin bed frame,this End Up twin bed frame; old full brass bed frame, bread maker, linens, lamps, crystal chandeliers rugs wicker chest, beanie babies, jewelry, punching bag, Disney VHS tapes, lacrosse gear, ceiling fan old ship’s chest, household items and more; AND. SAYS LUCY: shoe rack, pedestal sink; electric heater; horsehair drum (Lucy–is the horse for sale?) laptop, unique quilt and quilt hanger, pewter , Wedgewood bowl, brass fireplace items AND FREE ICED TEA. 37 Ocean Pathway: (at Central Ave) Julie: Coffee table; wetsuits, pictures, decorative surfboards; crystal scones, Dell computer; household goods. 68 Embury Ave.: Antique art work, books, collectibles, jewelry, vintage stuff. 75 Embury Ave. (off New York Ave.) : Wide selection of costume jewelry, tabletop and decorative accessories. 115 Asbury Avenue (at Delaware) Small furniture, vintage hand painted dresser, bag lots of costume jewelry, fabrics, trimmings, beads, baubles and bangles. Vintage items and antiques. Plus lots and lots more too ! 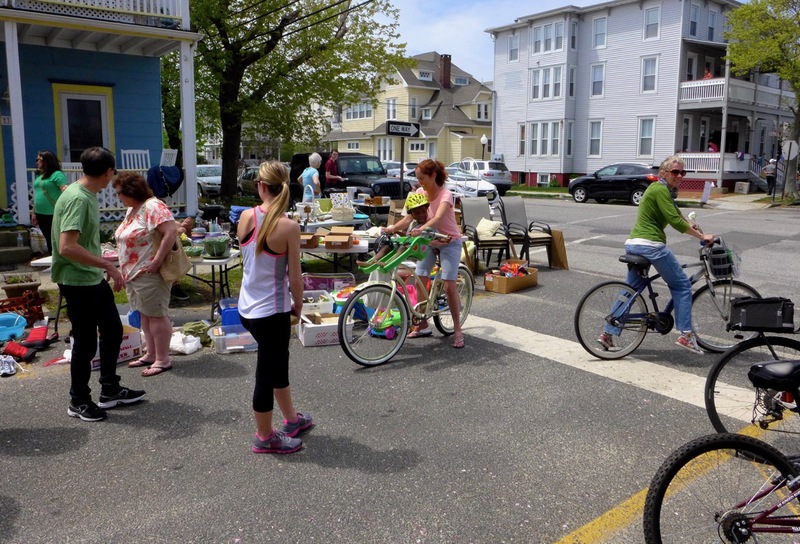 101 Asbury Avenue: Bicycles, tools, household items & outdoor décor. Tons of stuff and something for everyone! 83 Asbury: Vintage: new, borrowed, blue. Something for everyone. 70 Mt. Tabor Way: household items, books, china, Christmas, and children’s items. 94 Mt. Tabor Way: Tina—-Glassware; china; floor lamps; table lamps; mirrors; blank CD’s; kitchen items and cookware; white plastic patio table with 6 chairs; motorcycle jackets and helmets; etc. 81 Mt. Carmel Way. : Large assortment of items : antiques, fine china and other collectibles. 23 Heck Avenue: Trek Beach Cruiser bike with basket used twice (purchased from Brielle Cyclery,) amazing supply of baking supplies for decorating cupcakes, cake pops, etc, almost new juicer, electric piano. 60 Heck Avenue: (corner Pilgrim Pathway) Costume jewelry, beauty products, hand bags, sports teams sweatshirts, framed prints, household items, mirrors and much more. 89 Heck Avenue: furniture, pottery, glassware/china, baskets, antique typewriters, Victrola, records, books, golf clubs , large amount of Lenox items, and more. 148 Abbott Ave. Household items, rocking chair, jewelry, baby clothes, DVD’s, men and women’s clothing, shoes, puzzles, and children books. —much more. 15 Olin Street: (near Central) Flat screen TV,beauty products, accessories, men’s’ women’s clothing, home goods, small furniture pieces, patio furniture pillows. 67 Webb Ave. (at Pilgrim Pathway) Vintage bowls, pottery, glasses, dishes, antique picture frames/paintings, quilts/ linens, books, Stickley chair, early chairs, antique console/side tables, rugs, Victorian chair, vintage child’s chairs, books including vintage watering cans, and planters , hats, clothing, old wagon, silver butter dish and more. 109 Webb Ave. Mike: Downsizing from larger h one; clothes, furniture, just about everything!! 30 years accumulation. 15 Surf Avenue (at Beach Avenue) Set of 4 Mid Century Thonet chairs, doll house, pair of West Elm light fixtures, Christmas stuff, snowman blow mold, pink flamingo, clothing, pair Italian carved chairs, turquoise Mid Century bullet planter, striped slipper chair, cd’s, doll highchair, humidor, chenille bed covers, and more. 31 Atlantic Ave. Women’s clothing and accessories artwork, decorative, household. Indoors and out. Also on Friday May 12. 22 Pitman Avenue (at Beach) small furniture, household items, lamps, collectibles, antiques, kitchenware–dishes, 1950’s items, books, jewelry, and other items. 144 Broadway: Antique canisters, china, books, housewares and more. 113 Pilgrim Pathway (at Franklin):Hundreds of vintage jewelry, vintage furs, clothes, American pottery, milk glass, lusterware, planters, Rosenthal china, and plenty more. 73 Clark Ave. (at Pilgrim Pathway): Dishes, home decor pieces, outdoor pillows, small accent and end tables, CD player with speakers, books, 2 small animal carriers, kitchen items, ice buckets, camera tripod, coolers, beach chairs, games, pictures, bath scale, travel bags, and more. 76 Clark Ave. Kitchen/household items (decorative and functional) mirrors, lamps, chandeliers rug, women’s clothes, jewelry, accessories (purses, scarves, coats etc. ), CD’s and possibly some children’s stuff. 58 Cookman Ave. Unit B. (At Pilgrim Pathway) General items. 69 Stockton Ave. (between Pilgrim Pathway and New York Ave.) Assorted household goods, small scatter rugs, 2 vintage bentwood chairs, 2 wicker chairs, vintage glassware, Polaroid Land camera–Rainbow model. OG 4th Annual Town-Wide Yard Sale © Blogfinger photo. Central and Heck. Yard sailors can sign up through Friday May 19. Please tell us your nearest cross street. The sale is rain or shine, but the weatherman products a glorious day, and beautiful weather will help make this sale a success and lots of fun besides. Bring a bicycle as the best way of riding all over town (3/4 square miles) too visit all 44 sales. If it’s not too late to add a list of some items for 15 Surf…..Set of 4 Mid Century Thonet chairs, doll house, pair of West Elm light fixtures, Christmas stuff, snowman blow mold, pink flamingo, clothing, pair Italian carved chairs, turquoise Mid Century bullet planter, striped slipper chair, cd’s, doll highchair, humidor, chenille bed covers, and more. The only bad thing about Yard Sale Day for me, is that I won’t be able to go to the other sales. There seems to be some interesting things out there! I will be busy with customers, having many conversations, making deals, having laughs, and saying goodbye to my “stuff”. And I can count on a good night’s sleep that night! Jean Louise, I’m having a sale to keep me close to home so I don’t buy more stuff, hahaha! Good luck to everyone tomorrow! I just posted on my Instagram page to hopefully help drum up some biz (@shorehousechic).